New: 24th-26th May: TWASI Annual Exhibition at Nature in Art... including Art Extra. Free entry to the exhibition. New: 20th-25th August: Artist in Residence, Nature in Art, Gloucester. I will be in the studio daily 10:00am-5:00pm. Free entry to the studio, tea room and shop. More events to be added...please check back soon. NEW: 14th-16th September: MIWAS Exhibition and Art Market. Rookesbury Park Hall, Wickham, Hants. Along with work in the exhibition I will be attending the Art Market. Prints, greetings cards will be available for sale. please feel free to stop and say hello. Free Entry. 17th-19th August: Birding Fair, Art Marquee Stand 47, Rutland Water. I will again be attending the Birding Fair in the Art Marquee at Rutland water, STAND 47. Prints, greetings cards and originals of my work will be available to buy. Please feel free to pop by and say hello. Entry Fees Apply. STOP PRESS: June 2012: My new painting 'SILVERBACK' wins 'GOLD CITATION Award' at TWASI 2012. Burton, Chester High Road - A540, Wirral, CH64 8TF. I will have original artwork on show at one of the largest exhibitions of its type. Free entry. STOP PRESS: My original acrylic painting 'BLACKBACK' has been selected for the 'David Shepherd Wldlife Artist of the Year 2012' exhibition folder. The exhibition is to be held at the Mall Galleries, London, May 21st-26th. Free Entry. NEW: 2nd-10th June: TWASI Art Extra, Nature in Art Gloucester. I will be exhibiting at the 20th anniversary TWASI Wildlife Art Exhibition. I will be attending in person the 'Art Extra' event 2nd-4th June where I'll have limited edition prints and greetings cards of my work available for sale. Please feel free to stop by and say hello. Free Entry to the TWASI Exhibition and Art Extra Marquee. I will be in the studio every day from 10:00am-5:00pm. I will be demonstrating my painting technique and will be happy to answer any questions about my work. I will also have a selection of originals, limited edition prints and greetings cards etc... on show and available to purchase. Commissions can also be taken. HADDON GALLERY , Torquay, Devon. For details please contact Fiona and Paul Haddon on 01803 213000. The QUAY Gallery, Severnside North, Bewdley. For details please contact Rachael and Phil Mumby on 01299 404 488. 3rd-17th November: LUDLOW TOURIST INFORMATION CENTRE, Castle Square, Ludlow Town Centre. I will be displaying a selection of originals, framed/loose prints and greetings cards both in the window and inside. In the run-up to the festive period why not come and visit Ludlow... "Englands finest town". Visit the castle and many of the towns historic buildings, visit during one of the popular markets just opposite in the Castle Square, browse the many shops, take tea in one of the many traditional tea-rooms or have lunch/dinner at one of the award winning restaurants. Also you may get a glimpse of the Salmons taking on Dinham weir as they head back to their spawning grounds. NEW: PRIORY GALLERY (Art Through Nature), Banham Business Park and Craft Centre, (opposite Navigation Pub), Ye Old Stables, Hanbury Road, Stoke Prior, Bromsgrove, B60 4JZ. I have a selection of originals, limited edition prints and greetings cards now available at this new gallery. I will be periodically visiting the gallery. Please contact me for details. STOP PRESS June: 'Deep Thought' has won the DAVID SHEPHERD Award at the 2011 TWASI Annual Exhibition, NiA, Gloucester. Exhibiton of butterfly paintings/illustrations, including 2 by me, used in the new illustrated poetry book 'Shropshire Butterflies'. NEW 15th-31st July: NEWA wildlife art exhibition, Gordale Garden Centre, Burton, Wirral, Chester High Road, CH64 8TF. I have 3 paintings selected for this years Exhibition ('DEEP THOUGHT', 'CATCH OF THE DAY' and 'WINTER THAW'). NEWA is one of the biggest art exhibitions dedicated to wildlife and natural history. NEW 19th-21st August: BIRDING FAIR, RUTLAND WATER, RUTLAND. I will be in the Art Marquee at this years show where I will be sharing a stand with fellow wildlife artist Mike Hughes. Along with a selection of original paintings I will have Limited Edition Prints and greetings cards available. NEW 26th-29th August: MIWAS annual wildlife art exhibition and Art Market. Marwell Wildlife Park, Marwell, Wichester, Hampshire. I will have 4 paintings on show in the exhibition. I will be attending the art Market from 27th-29th August where I will have a selection of Limited Edition Prints and greetings cards available. A selection of my original work and limited edition prints can now be seen at The QUAY Gallery, Severnside North, Bewdley. For details CONTACT CARL or call the galley owners Rachael and Phil on 01299 404 488. 6-10th Feb :SPRING FAIR, NEC, Birmingham . The launch of some Limited Edition prints in association with Haddon Galleries, Torquay. 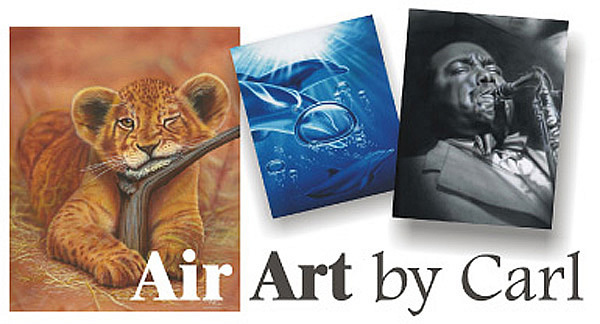 I'm exhibiting for the first time 4 artworks with the Association of Animal Artists. 17th-22nd May:Artist in Residence: NATURE IN ART, Wallsworth Hall, Gloucester, GL2 9PA . NiA have been kind enough to invite me back to work as Artist in Residence. I will be working in the studio from 10.00am-5.00pm each day. You are welcome to come and watch me at work. I'll be happy to answer questions about my art, inspirations and my airbrush painting technique. I will also have available a number of original paintings on show plus prints and greetings cards that I will be happy to personalise for you. (Remember if you are able to attend and are interested in a particular original artwork still available or print please let me know and I'll make sure I bring it along for you to have a look at.) HOPE TO SEE YOU THERE! 2nd-3rd October: Apple weekend and craft fair, Berrington Hall, Leominster. Originals, limited edition prints, greetings cards and other items based upon my original artwork will be available to purchase. Remember if you are able to attend and are interested in a particular original artwork or print please let me know and I'll make sure I bring it along. Normal National Trust entry fees apply. STOP PRESS: TWO OF CARLS PAINTINGS HAVE BEEN SHORTLISTED FOR THE FINAL JUDGING OF THE BBC WILDLIFE ARTIST OF THE YEAR 2010. 26-30th August: MIWAS EXHIBITION, Marwell Hall, Marwell Wildlife Park. Another fantastic wildlife art exhibition. One of my BBC Wildlife Artist of the Year shortlisted paintings will be on show. I will be attending the 'Art Market' over the bank holiday weekend where I will have 'NEW' signed limited edition art prints and greetings cards for sale. Come and say hello. 16th July-2nd August: NEWA EXHIBITION, Gordale, CH64 8TF. One of the best wildlife art exhibitions in the UK. 28th May-6th June: TWASI Annual Exhibition, Nature in Art, Twigworth, Gloucester. I will be demonstrating on the holiday weekend of 5th June. I will also have signed prints and greetings cards available to purchase. 1st-11th April: TWASI exhibition, Port Lympne Wild Animal Park, Kent. 16th-21st February: Artist in residence at NATURE IN ART Gloucester. Come and see me at work in the studio at Nature in Art. October: 'ON WATCH' wins the Bromley Art Supplies brochure cover competition. September: Artists and Illustrators Magazine feature showing the painting of 'AFTER THE RAIN' . 18th July-1st August: Event: Church Stretton Arts Festival - Venue: Church Stretton School. STOP PRESS: CARL'S PAINTING 'DIGBY FAIRWEATHER' HAS BEEN PRESENTED TO THE LORD CLIFDEN PUB IN B'HAMS JEWELERY QUARTER IN AID OF BIRMINGHAM CHILDRENS HOSPITAL. STOP PRESS: THE PRESTGEOUS INTERNATIONAL WILDLIFE ART EXHIBITION 2009 DAVID SHEPHERD AWARD WAS AWARDED TO CARL'S PAINTING 'CONTEMPLATION' CLICK HERE TO VIEW DETAILS. 2009: A book has been published, 'The Day the Earth Grew Hair' containing illustrations by Carl and 2 other artists. The book features a selection of rhyme and verse penned by former Birmingham Poet Laureate Giovanni 'Spoz' Esposito. Have a look on www.spoz.net. Nov 2008: Digby Fairweather painting auctioned for Birmingham childrens hospital.